I always feel that a humble person is easy to be around. They do not waste time on bragging about what they have, who they are or where they have been. They play down their achievements and are more attentive to other’s needs. Whereas, the opposite of this is someone who is proud and conceited. Both things are not attractive traits. It really is difficult, for me, to spend a lot of time with someone who is boasting. They are only interested in selling themselves and have no interest in who you are or what you think or know. I have always found people with pride to also have the biggest egos – and usually, the biggest mouths to go with it. But a humble person is quiet, respectful and attentive. Which one would you rather be around? Or for that matter, which one would you rather be? Another trait of a proud and conceited person is that they are not open minded and they are not willing to learn from others, as they think they already know everything. Now this is something we have to guard against as we move along our chosen path. If we start to think we are making great progress and we are already better than the people around us, we are going to run up against obstacles, such as pride. We have to stay open minded. Just because we know a way to do something, it doesn’t mean another person doesn’t know a better or easier way. We shouldn’t assume we know best. A humble person will continue to learn throughout their lives. Once we become a proud and egotistical person, it is very hard to subdue these emotions. So it is better not to travel down that road in the first place. We have to also be mindful of people praising us. They maybe flattering you because of your position or they want something. However, it maybe that you are worthy of praise, but be careful, our ego loves to be praised and it may lead to pride if we are not mindful. So what are the causes of pride? There are many, but two main causes are; dualistic thinking and an inflated sense of self. ‘By being alert and attentive, he begins to let go of cravings as they arise. But whatever he begins to accomplish, he should beware of inner pride. He must avoid thinking of himself as better than another, or worse or equal, for that is all comparison and emphasises the self’. And don’t let it go to your head – this is the practice of a bodhisattva. So it is clear that humility is a trait we have to work at, or we could find ourselves getting wrapped up in pride. The pride I am talking about here is our over inflated sense of self. It is not the pride we have for our children, loved ones and so on. This pride stems from love and compassion, whereas, our over inflated sense of self type of pride stems from our ego. Taken from the forthcoming book ‘Life’s Meandering Path’, which is based on thirty-eight principles originally taught by Gautama Buddha, this intriguing read guides audiences on a journey toward personal responsibility and ease of suffering. It is interesting that you rank playing down one’s achievements with virtues. That is as false as exaggerating your achievements. Perhaps you meant that humble people do not discuss their achievements unnecessarily. Maybe the word “humility” is a misnomer in itself. Humility itself is a prideful thing, as it is something we strive for. Once achieved, we are happy that we have it, and thus, lose it. It is hard to express what I am trying to get across, but it is better to strive for a realistic view of oneself and others. 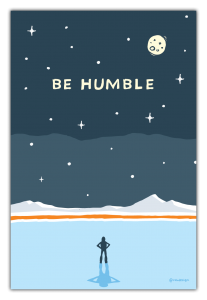 Why get caught up in being either being humble or prideful? These are just words, they are states of being that we make up in our thoughts. You are at once better and worse than the person next to you. That is neither good or bad. It is reality. Stop counting and accept. Thank you so much for your thoughtful comments. They give us all something to think about.